Our screenings are FREE and all are welcome to. 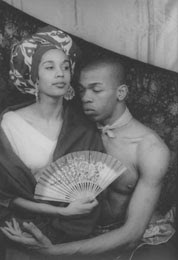 This is a love-story of Carmen De Lavallade and Geoffrey Holder, who have been happily-married for 53 years. Carmen was discovered by Lena Horne and got her start in the Fifties as a dancer, appearing in Hollywood films like "Carmen Jones"and "Odds Against Tomorrow." However, she achieved fame as a soloist with the Alvin Ailey Company and as a prima ballerina with the Metropolitan Opera. Today, Carmen, a renowned choreographer, has been on the faculty of Yale since 1970. Geoffrey, the 6'6" gentle giant, was born here in Trinidad and made his way to New York where he broke into showbiz on Broadway as a dancer. His myriad talents led to noteworthy accomplishments not only as a dancer but also as an actor, director, choreographer, costume and set designer, painter and musician. His stage career peaked when he won a Tony award for directing "The Wiz." As engagingly chronicled by co-directors Linda Atkinson and Nick Doob, "Carmen & Geoffrey" not only depicts a pair of extraordinary over-achievers but also a touching portrait of a very loving couple. “I walk through doors,” Geoffrey Holder thunders in the documentary “Carmen & Geoffrey.” “If I’m not wanted in a place, there’s something wrong with the place, not with me.” And when this 6-foot-6-inch choreographer and painter, with a big toothy grin and the oratorical style of a Caribbean James Earl Jones, thunders, the earth moves. Mr. Holder has been a fixture in the theater and dance worlds beginning with the 1954 musical “House of Flowers.” His words evoke his fearless self-confidence in the face of racism. The Carmen of the title is Carmen de Lavallade, Mr. Holder’s wife and creative partner for more than 50 years; now in her 70s, she is still a beauty. As the film, directed by Linda Atkinson and Nick Doob, follows Mr. Holder, he radiates the energy of a sun king. By his side is Ms. de Lavallade, the New Orleans-born dancer and choreographer who grew up in Los Angeles and met him when they appeared together in “House of Flowers”; they married in 1955. The film spends the bulk of its time with Mr. Holder, who recalls that from early childhood he knew he wanted to dance and to paint. He was 7 when he made his performing debut with the Holder Dance Company, a troupe founded by his older brother, Boscoe, with whom he had a loving but competitive relationship. By the time he was discovered by Agnes de Mille in 1952, Geoffrey Holder was already an accomplished painter, and the canvases shown in the movie suggest the sensibility of an extroverted Paul Gauguin steeped in Caribbean folklore. After “House of Flowers” he formed his own dance company and was also a principal dancer with the Metropolitan Opera Ballet. He reached a pinnacle of acclaim in the mid-1970s with Tony Awards for best director and costume design for “The Wiz.” The fantastic outfits bore his artistic signatures: a brilliant palette and wildly playful and inventive imagery. The clips of his choreography and costumes for “Timbuktu!” (a 1978 Caribbean version of “Kismet”) and “The Prodigal Prince,” a dance biography of the Haitian artist and voodoo priest Hector Hyppolite that he calls his answer to “Giselle” and “Swan Lake,” reveal work that was even bolder. “Carmen and Geoffrey” is crammed with excerpts from pieces the couple created or performed in, separately and together, over 50 years. An informed, affectionate commentary on their work is provided by Jennifer Dunning, a former dance critic for The New York Times, whose biography “Geoffrey Holder: A Life in Theater, Dance, and Art” was published in 2001. The film includes an excerpt from Ms. de Lavallade’s signature piece, “Portrait of Billie,” an angular modern dance tribute to Billie Holiday choreographed by John Butler. Ms. de Lavallade, we learn, was the best friend and dancing partner of Alvin Ailey, who was brokenhearted when she married Mr. Holder, although their relationship was platonic. The film follows Mr. Holder on one of his annual visits to Paris, where he reflects on the American expatriate performer Josephine Baker. She was a kindred spirit who was lionized in Europe but not in America, where she tried to walk through doors only to have them slammed in her face because she was black. “Carmen & Geoffrey” leaves you wondering why its subjects are not widely recognized as national treasures. The marginalization of the dance world in American culture is certainly one factor. But so is the subtle but still pervasive racial attitude that views work like Mr. Holder’s as “exotic.” What does it say about our culture that Mr. Holder is probably best known as the voice in the “uncola” commercials for 7-Up? checked it out @ Quad on Sunday, they need to show this doc in all schools in Trinidad.